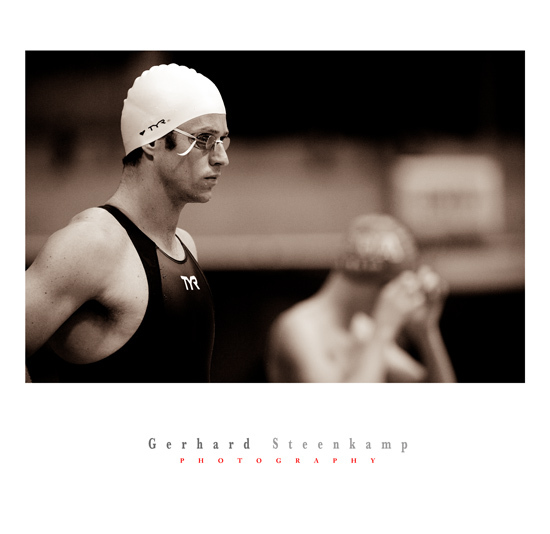 In the mid 90’s I had the privilege to have met Hoffie Hofmeister, head photographer for the Rapport (Sunday newspaper in SA) at the time. What always amazes me about Hoffie was that how he always manage to be at the right place at the right moment while taking sport pictures. 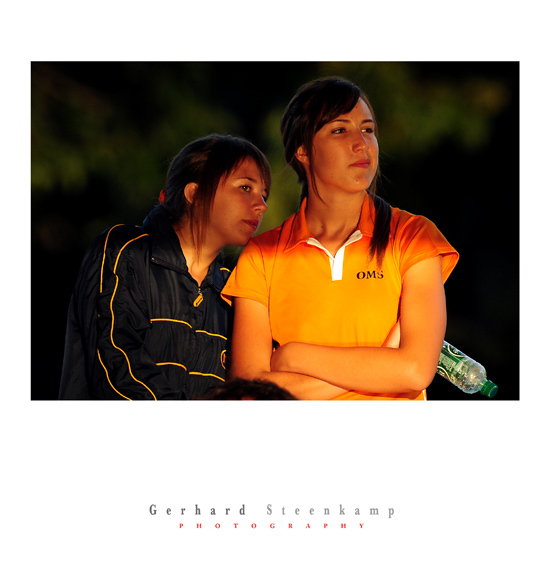 If one opens the Rapport on Sunday morning all the key moments were captured by Hoffie. I always used to watch Hoffie at Rugby tests and see him floating around the field but never manage to sort out how he got it so spot on. In 2007 i again met Hoffie at a Athletics meeting in Rustenburg and while chatting asked him how he always manage to read a rugby match so well. He explained that when he started of as staff photographer for the newspapers in the late 60’s early 70’s they used plate cameras and were issued 5 plates per match. He then used to shoot one scrum, one lineout and three action shots. Yes five images per match. There were no other way but to have picked the moments that he wanted to capture very carefully. This experience stayed with him and that’s how he managed to got it spot so well. These days we are using digital cameras shooting away at 10 frames per second. 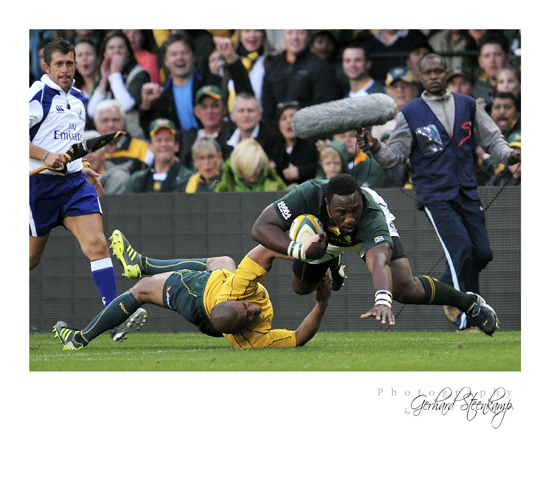 At a test match like the SA vs NZ on 20 August in PE there were forty accredited photographers. That mean for a 1 sec movement there is a chance that 400 images of that movement could have been photographed. Okay what’s the point. In golf there is a saying that says ” driving is for show and putting is for dough” Well the same here. 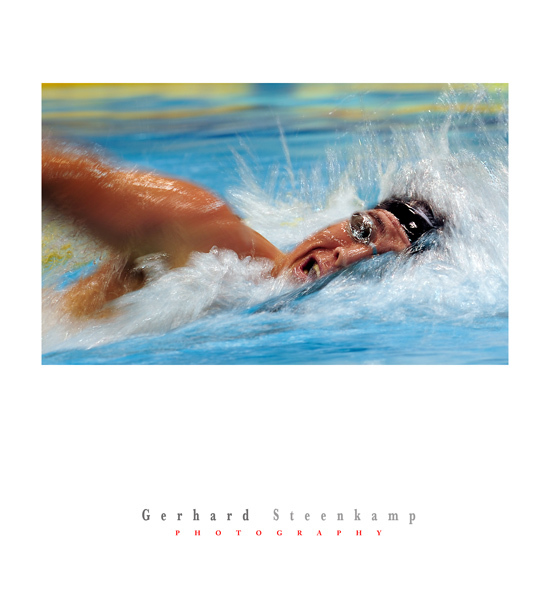 A good sports photographer must be able to capture the action well but what makes a sports photographer stands out from the rest is what he does more than just shooting away at 10 frames a second. By that i mean seeing things from a different angle, shooting emotions off the field, before the match and after the match. Thats is where photographers like Hoffie, Walter Looss, Chris Smith, Erich Baumann, Tony Duffy and a few others is and were just in a class of their own. 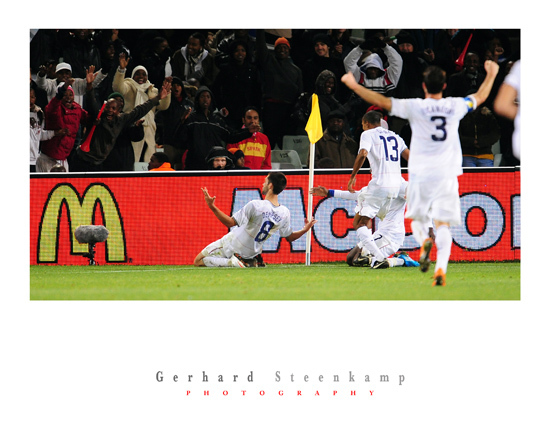 Here a few images that i took during the Test match on Saturday 20 August 2011. 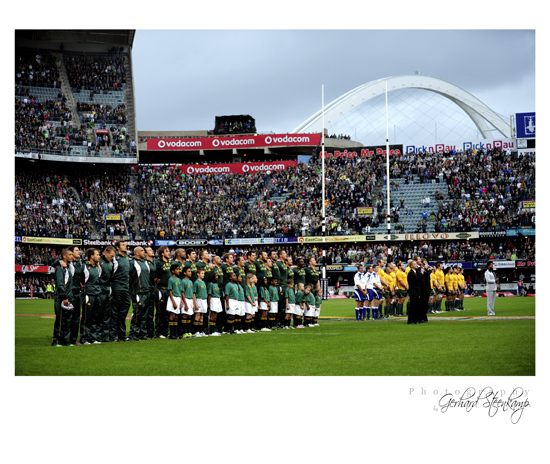 Fifteen years back on 10 August 1996 i did my first test in Cape Town between the Springboks and the All blacks and till today there are nothing that beats the atmosphere at such a test match. The adrenaline rush one gets during such a test is just something that will keep one going back year after year. 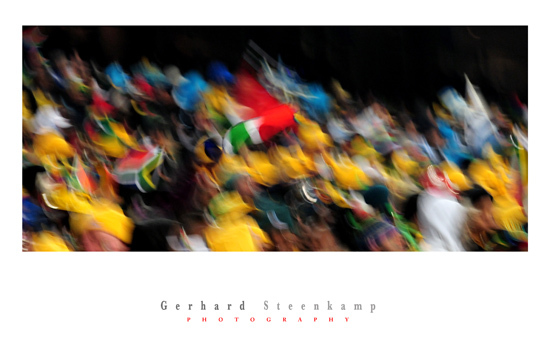 I had the privelage to have covered the Sa vs Australia test in Durban on 13 August 2011 in Durban. Apart from having absolutely no internet signal to send images i had a great time and came away with some nice shots. After the match i went back to the hotel in Umchlanga and had full 3G connection to send some images away. 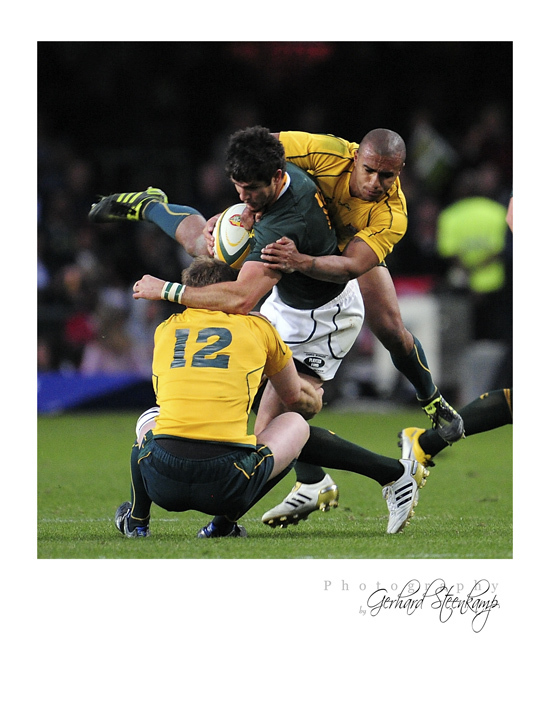 This week i’m going down to Port Elizabeth for the Springbok All Blacks clash. Looking forward to it and can’t wait to feel the vibe in the PE stadium. Last time i was there was during the Soccer World Cup covering the England vs Slovenia match. What a stadium and as with all the World Cup Soccer stadiums the light is so much better for photography appose to the Kingspark stadium where one still have to shoot at 4000 ASA at a speed of 1/640 sec. Some of the new stadiums one get away with 2000 ASA and 1/800 sec at F4 which is more than enough to get some decent shots. So far 2010 has been a great experience for me. 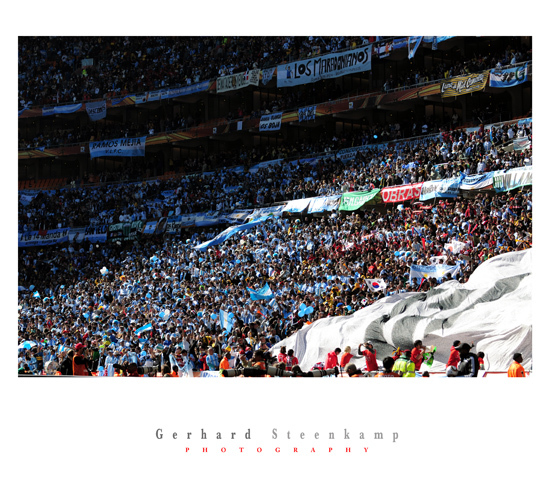 As a Sports Photographer the Soccer World Cup open up a new world for me and lifted my photography once again to another level. But again i learned that you must never think you can take photos and think you’re a “yster”. I saw some photo’s of the other photographers during the tournament that will keep me humble for awhile an will inspire me for the next few years. Well at least i featured in the latest addition of Sports Illustrated (August 2010). Although i was watching the game at that stage and not taking photos as i was suppose to do. 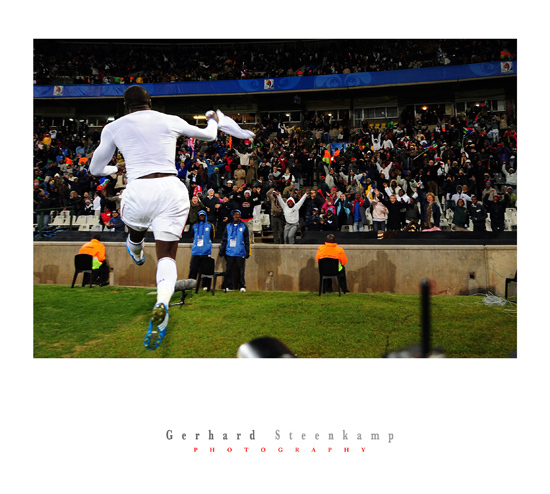 This photo was taking during the Bafana vs France Game in Bloemfontein on 22 June 2010 by Jewel Samad of AFP. Thirty days, 7500km, 15 games, 7 stadiums, thousands of images and now it’s all over. 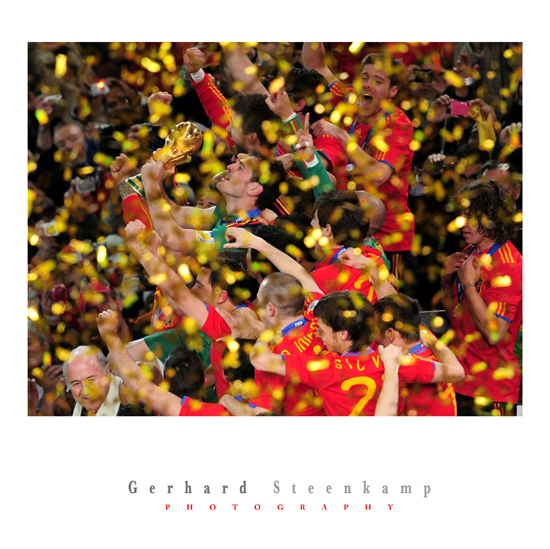 Spain is the new world champion after beating Holland 1-0 at Soccer City last night. I had the privilege to be commissioned by a French Media Company to cover the World cup for them. Once again it was an experience second to none as my friend Jubs would say and worth every single kilometer I drove through the country stopping at hundreds of road work stops, well nearly feels like hundreds and nearly as bad as sorting out match passes and parking passes. The rest were a blast and I had the most memorable time of my life. Although the final wasn’t the greatest of games to watch as most finals are the closing ceremony was out of this world with technology you can’t believe. 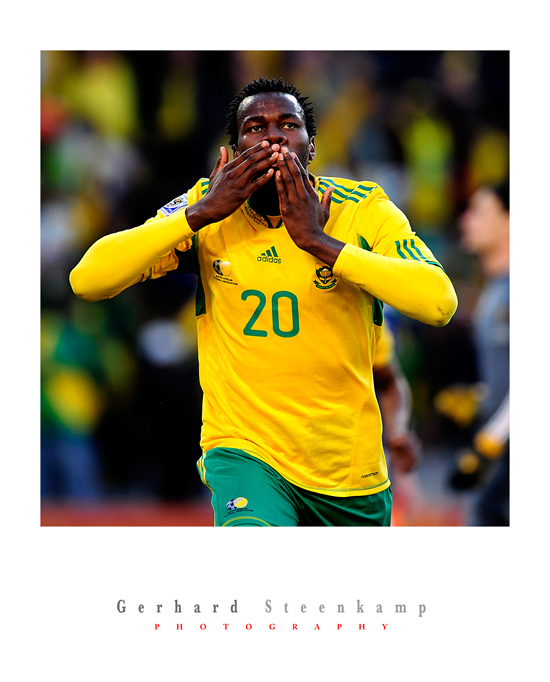 After everything I think we as South Africans can be very proud and can just say… VIVA South Africa….! because we are champions in our own right to host an event of this calibre. Congratulations to Danny Jordaan and his team who exceed all expectations. Next week is the Billabong Pro in J-Bay. How great it’s going to be not to be hit by long lenses on the left and right of your head when the game is moving from left to right. Hope to get a few nice surf images and catch up with my old Varsity buds Jubs and Willis. In the middle is Iker CASILLAS the captain of Spain with the World Cup Trophy. At the moment I’m at Ellispark to cover the USA vs Slovenia match at 16:00. The fifth match I’m covering this week in the 2010 Soccer World Cup. So far it’s been an experience of a lifetime and actually a dream come true. 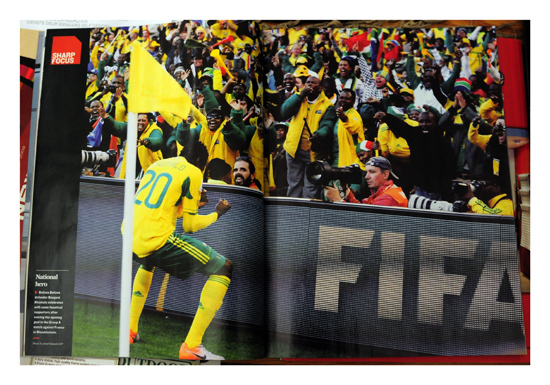 To shoot at Soccer city with a capacity of 95 000 people is something i can’t describe in words. Specially yesterday’s match between Argentina and South Korea was amazing. To see all the banners hanging from this stadium around ten story buildings high is something i haven’t experience before. South African Crowd on 16 June 2010 at Loftus in Pretoria. Bafana Bafana vs Uruguay. 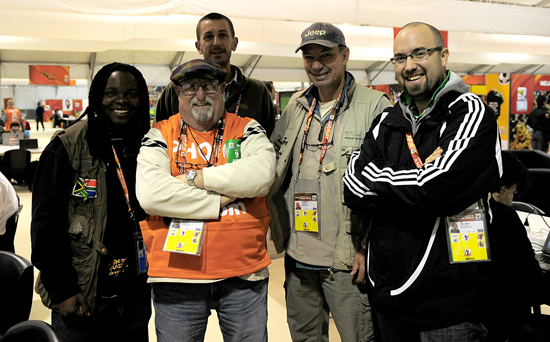 Stampeding photographers at Ellispark on 15 June 2010. Brazil vs North Korea. This is just a small group of the photographers at such a game. 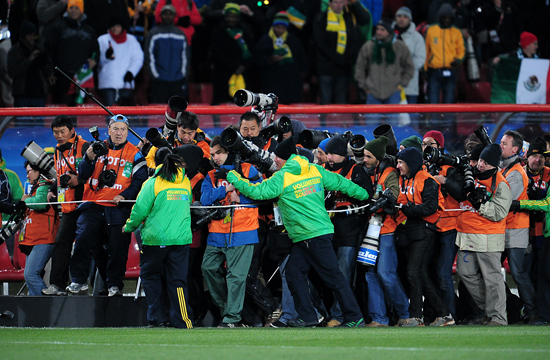 At this game there were over 200 accredited photographers. 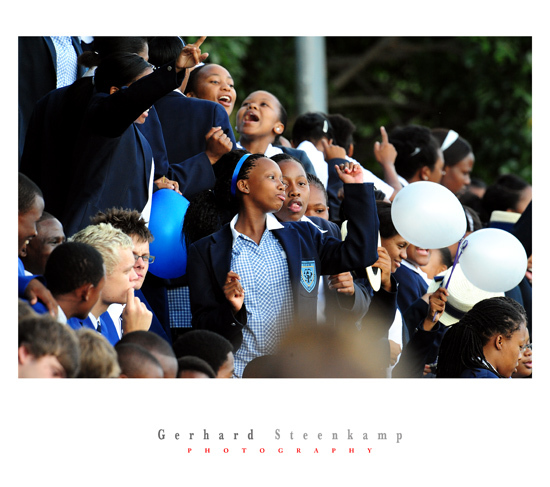 Seven days to go and everyone in South africa are waiting in anticipation to see if everything will go of well. Looking forward to see favorite teams like Spain, Brazil in action with players like Kaka, Xavi, Torres and David Villa in Action. And then probably the worlds nr. one player at the moment, Lionel Messi of Argentina. Okay then one mustn’t forget players like Cristiano Ronaldo, Rooney and Ribinho. This is going to be one big feast. Spain must be one of the favorite teams to win this tournament seeing the fact that they only lost one game out of 45 in three and a half years. That one game was during the Confederations Cup 2009 in South Africa against the United States of America during the semi-Final in Bloemfontein. Another reason that make Spain the favorite is that seven of Spain’s players are rated among the top 50 players in the world. Nearly the whole team. South Africa’s Steven Pienaar is the only player from South Africa that is rated in the top 50. I had the privilege to cover that game in 2009. Here a few decisive moments that let the USA through to the Final which they played against Brazil. Brazil won the tournament by the way with Kaka the man of the series. Jozy Altidore after scoring for the USA. Clint Dempsey after scoring his goal for the USA. Torres on one knee after Spain losing against USA in the semi final during the 2009 Confederations Cup in Bloemfontein, South Africa. 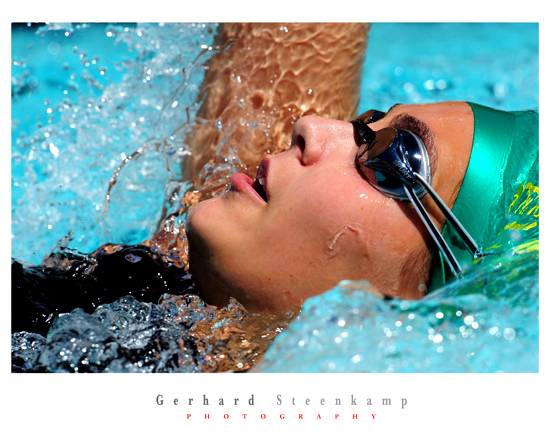 From tomorrow till 19 April I’ll be covering the SA Senior National Swimming Champs at Kingspark Pool in Durban. 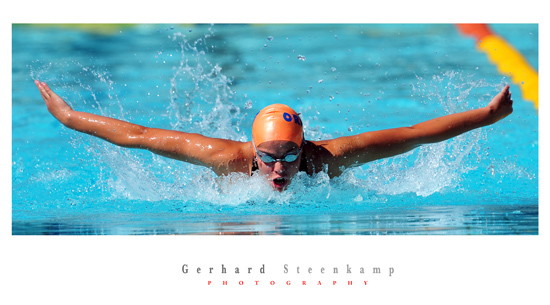 Seeing that Swimming is my favorite sport to photograph I’m looking forward to the event and will post a few images later this week. Here a few of last years photos. 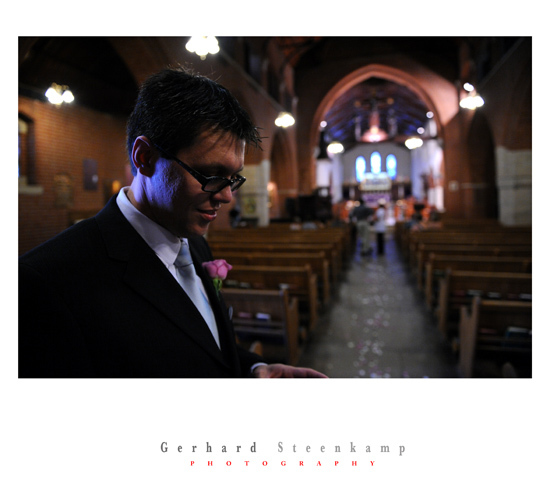 Did Frances and Lenise’s wedding today at the Anglican Cathedral in Bloemfontein. Major Henry Warden, founder of Bloemfontein, laid the foundations of this wonderful Victorian building in 1850. The Anglican Cathedral is located in the east end of Saint George’s Street and is well worth a visit when in Bloemfontein. St Georges street is the street where Bloemfontein actually started in 1840. Also in St. Georges street is the First Raadsaal. This is a very modest building made of dung floors and has a thatched roof. This house once served as a church, then a conference chamber, a parliament house, school for the local children, and at one time it housed all of the city’s original civil institutions. 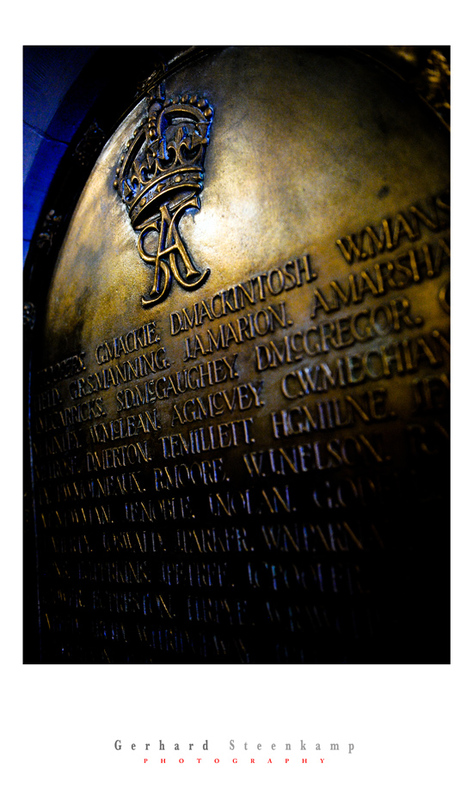 Here a few photos that i took in the Anglican Cathedral. 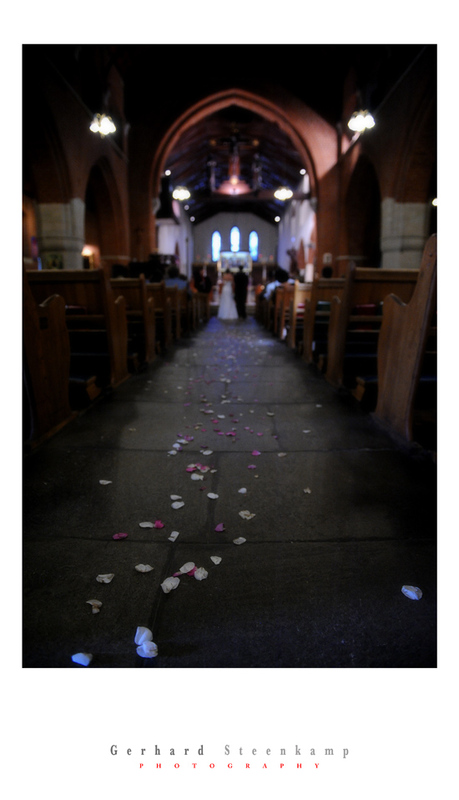 I took a White Balance reading with a CBL lens and further used only available light. Camera used was a Nikon D3 and a 24-70mm F2.8 lens. Die naweek wat verby is was weer ‘n bedrywige een op kantoor met die Noord Vrystaat vs Suid Vrystaat swem op Donderdag, Inter Hoër swem op Vrydag en Saterdag en ook die Suid Vrystaatse Laerskole Atletiek kampioenskappe op Saterdag. Hier ‘n paar fotos wat ek geneem het tydens die Inter Hoër Swem.